There are nearly 50-thousand wild horses and burros being held in Federal facilities across the country. That’s more than are even left in the wild. The Federal Bureau of Land Management, which is in charge of managing the animals, has continually come under fire for the conditions at its holding facilities. Here is my latest column, in the Reno Gazette Journal, calling on the Palomino Valley adoption center in Nevada to provide the horses and burros with protection from the elements. As the temperatures in the area began to climb north of 100 degrees last summer, the public began to petition the BLM to do something about the conditions at the Palomino Valley wild horse adoption facility north of Reno. Nearly two thousand horses and burros were languishing in triple-digit heat in huge, open, dirt pens with neither shade nor shelter. The outcry, along with the temperatures, continued to climb until the facility announced it was going to start installing sprinklers for the horses. Praise, including mine, rolled in [RGJ, July 6, 2013]. Officials from Washington then flew to Reno to hold a community meeting to “brainstorm with the public” on solutions for providing the horses some relief. Horse advocates arrived from Nevada and beyond, armed with proposals. They brought offers for shade and documentation from several equine veterinarians that high heat and no shelter could be lethal to the animals. 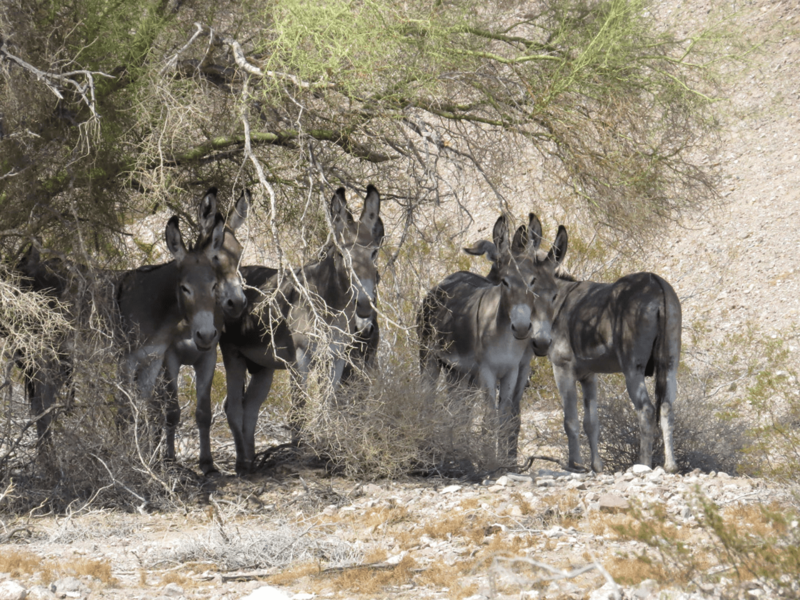 One former USDA veterinarian even warned the BLM that the conditions were calling for “emergency action” to ensure the safety of the horses and burros. The officials arrived, made promises and flew back to Washington. Shortly afterward, advocates discovered there were only two common household sprinklers attached to a fence at Palomino Valley for the nearly 2,000 animals and that no more sprinklers would be forthcoming. No shade was forthcoming either. The horses and burros continued to be subjected to scorching heat, driving rain, wind and snow through the rest of the summer and winter. Had they been in the wild, they would have been seeking shelter under bushes and trees. 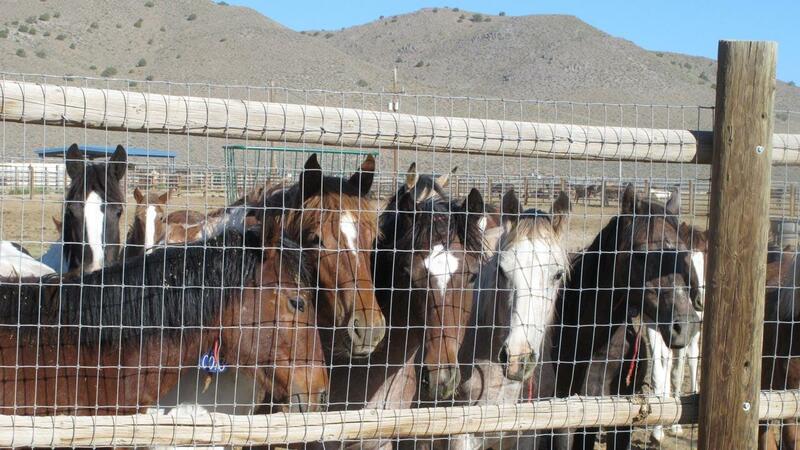 Half of the horses and burros are gone now, sent out to other facilities across the country. A shade “trial” is underway, with three temporary tarps, which cannot adequately provide protection for 900 animals. The two sprinklers that were installed are gone. Advocates who believed the promises now feel betrayed; those of us who applauded the initial news release regarding the sprinklers feel foolish. Last year, the National Academy of Sciences issued a harsh report on the BLM’s Wild Horse and Burro Program. Even though the study — commissioned by the BLM — concluded the agency’s own management of the animals was a large part of the problem, the BLM is continuing to do business as usual while the number of horses and burros in holding continues to skyrocket, as does their carrying costs. The situation has now reached crisis proportions. Some members of the BLM’s Wild Horse and Burro Advisory Board, which is made up of mostly ranching, mining and hunting interests, have already suggested slaughtering the animals to control their numbers. The winds seem to be shifting against the horses and burros. And from this wind, there is no shelter. Despite being federally protected, the management of America’s wild horses and burros is complicated and dominated by politics, priorities and special interests. But there is nothing complicated about temperatures over 100 degrees or those below freezing. This kind of weather kills. Given that half of the wild horses that are left live in Nevada, the BLM must find a way to provide these warehoused animals at least a minimum of shade and shelter. Anything less is just talk to a public grown weary of empty promises. Ginger Casey is an Emmy-award winning journalist who began her career in Reno. my heart goes out to them ,what more can we do to stop the mindless slaughter of these animals ? BLM manage the land by protecting the land and the creatures that inhabit it from outside predators – in most cases,”man”;and in this particular situation,the Bureau of Land Management. Let these animals run free and survive (and die)on their own as they have for centuries. All of their talks about why they have needed to round all of the Wild Horses and Wild Burros up,are nothing but lies for excuses for them to round them up! None of what they have told the public is true, all the Wild Horses and Burros on the public ranges are fat and healthy with shiny coats! And their blaming the Wild Horses for the public grazing lands being destroyed is pure garbage it is not at all true, horses do not destroy grazing lands they eat a bite here and there all the while continuously moving they do not stand there and munch until it is destroyed! The fact of the matter is, it is the ranchers whining wanting the public lands for their cattle, if they have their way their cattle will also be on the refuge grazing! Also it is the hunters lies of the horses eating all the grazing grass saying they are destroying the food source for the Elk and antelope which is also not true, these Wild Horses are not the previously owned horses they say they are that have become Ferrel in the Wild, they are true Native Wild Horses that have been running free on the ranges even before my American Indian Ancestors were here!!! They were here even before the Elk and Antelope!!!! SO who is taking grazing lands from who??? I’ll tell you it is our Government taking the Wild Horses and Wild Burros from their Native homes and grazing lands and the whining ranchers and Trophy hunters making them do it! The ranchers and Trophy hunters and the mining interests hate the Wild Mustangs and have an agenda for themselves and have no business even being on the Advisory board!!! They are the reason for all of this happening and should be removed from the advisory board and never allowed to have any say in the matter of the Wild Horses and Wild Burros!! It is there pure Greed and self serving agenda that is doing this to our National Treasures whom are federally protected and it needs to STOP NOW!!! Everyone of them needs to be removed from the advisory board permanently! And everyone of the BLM and U.S. Fish and Wildlife service having any hand in the destruction and removal of the Wild Horses and Wild Burro herds and their sterilization needs to be permanently removed from their jobs and never allowed to manage the Wild Horses and WIld Burros again. I feel that only people with Special interests in Truly protecting the Wild Horse Herds and the Wild Burros herds should be the only ones managing them, only people with the true passion of protecting them and their jean pool should be protecting them PERIOD!!! None of these Wild Horses should be ever made to be sterile not ever! It is natures natural selection that lets only the strong of the herds breed to carry on their Native jeans! The Native Wild Horses have amazing bloodlines and are a jean pool we should never destroy! These Wild Horses have lived on their own with no help from anyone and are amazing Horses strong, healthy and majestic and Gorgeous Wild Horses! Never should they have been rounded up! I also will go on to say that the destruction of the refuge is in no way the Wild Horses or Wild Burros for that matter, that is all the fault of humans! Everything humans are doing is destroying this World we live in, and the Wild Horses were here long before any of us! And the lands were lush and beautiful until humans came and did all the things they did to it and are still doing even more destruction to these beautiful lands!! It is not the Wild Horses fault of the plight for water, and I see none of them dying of thirst in the Wild or dying from the heat there either. However if the water where they are is becoming scarce it is not because of the Wild Horses and Wild Burros, it is because of Global warming pure and simple. Which that can only be blamed on the humans causing it, the mining plants, coal etc causing the heating up of this planet and also causing the weather problems lack of rain, etc! The Wild Horses and Wild Burros do not need managing, nature does that and it has since before we were here! Also another reason they do not need to be managed is the true and hard fact that humans are going to destroy this planet long before if ever the Wild Horses and Burros did get out of control. But because humans are going to continue to keep doing what they are doing to destroy this planet these Magnificent Wild Horses and Wild Burros need no managing, because this planet will no longer be here if the day ever came that they did need to be managed! Also we may need these Wild Horses once again, when everything in this world does go to hell in a hand basket, because we may need them to get us where we need to go again, or to fight our battles again, and to help us to be able to hunt for food etc. If we allow BLM and the U.S Wildlife service continue on there path of elimination of them, we will not have them when we need them, and I am telling you we will need them! If they make them sterile and destroy their bloodlines they are also going to be destroying us! All of the Wild Horse herds should be reassembled and their herd stallions returned to be with their herds and if they have altered their Stallions that is a shame! and shame on them! If this is the case than one of the Stallions offspring hopefully they have not all been altered as well, should be put into the herds with a few other Stallions from the original Stallions offspring for a natural selection for the new Stallion of their herds! And all herds should be returned to their homes from the states where they were taken from (period)! And again I will say it, all of them should be removed from the Wild Horse and Burro management, and only special interest groups, horses Sanctuaries etc and only people who have been fighting for their freedom and know that sterilizing them and surgery to make them unable to breed is not something that should ever be done! RETURNING THEM TO FREEDOM NOW, IS THE ONLY ANSWER!!! If I had a ranch large enough to support all of them and I could I would love to protect and keep them safe and have them roaming free in pastures on it and not in pens! The Horse is truly a magnificent species on this planet, and God put them here for us as a gift and for us to see that they have a soul just as we do, and he put them here to teach us that and for us to learn to be kind and gentle with all creatures, if you earn the trust of a horse it will be so with that horse for your lifetime with that horse…a Horse is spectacular, majestic, and powerful and also can be so gentle…the horses have a soul and feels everything we do and more, they are gods most sensitive creature they most resemble us and why the horse was a gift to us, to be valued and protected! Thank you for writing to inform the public of how the government perpetuates the abuse and neglect of animals in this country. The Bureau of Land Management serves only to profit the ranchers regardless of environmental damage and the loss of habitat to numerous species. It’s a disgrace. What is necessary to preserve the wild horses is to stop the rapid growth of the herds. The best way to do that is to proud cut all the stallions in certain herds. That way they will not be able to reproduce. Eventually a fertile (bachelor) stallion will find the herd and the herd will continue. The BLM doesn’t have a bit of concern about these horses. They only acknowledge them when it gives them good press. I notice a lot of people wanting to just leave these horses alone and let them run wild. Well, if that is what was truly done, the wild horses would be close to extinction in the U.S. However,these horses get yearly vaccines, and are vet checked every year. If they didn’t get vaccines West Nile, Distemper, and sleeping sickness, would have pretty much wiped out the wild horse herds. Because of the extras they get these horses don’t experience the death ratio that would be normal for a wild population. Many wild horse herds also get hayed during the harsh months of the year too, instead of having to face starvation during bad times. People can’t have it both ways, you can’t say let them run wild then gripe when they die off from disease or famine or gripe about how the BLM handles a problem that they created by letting them over populate. No perfect solution to this problem, but I do know that wild horses are both beautiful and sadly a problem because of mismanagement. I thought you were committed to the welfare and care of the animals you have under your control. Please do not be another disappointment about our government and those they put in power. These animals are “wild”. If the BLM does not want to take care of them, let the free. They know how to take care of them self. If a person owned horses and did not provide shelter for the horses, they would be fined. This is animal cruelty. As I read this a horrible thought jumped into my mind. Why or why, would the round-up these animals to just for them to languish away in stock pens. Think about it, people. Just actually think about it. There is only one possible reason for these round-ups! Rather than simply transport those animals to somewhere else to house them; do you not think they did something else? What do they do with cattle they have rounded up and placed in holding pens? They send them off to slaughter!!! Now, prove to me that that is not exactly what happened to all of the horses that supposedly were sent to other ‘holding pens’. Might they be ‘holding pens’ at a slaughter facility? Because after all, why else would they have spent all of that money to round them up and corral them? In their minds the only option to continuing caring for all of these wild animals; (which is costing so much money for them). Is to slowly get rid of them. Does anything else make sense? They sure don’t seem to care if the animals die due to extreme temperatures. So why would they not sell some off to counter the expense of keeping some to keep up appearances? I say to you, if you can’t find proof of those animals actually being transferred to other holding pens; the truth of the matter is very obvious. However horrific it is, it must be the truth. Why would they spend money to keep these animals alive & well, when they were simply waiting to ship them to slaughter? It would make no sense to them to do otherwise. Please, tell me I am wrong. I prayed for those poor animals this winter knowing what conditions they were forced to be in; while in those awful holding pens. I knew many would not survive. Now, I think I know why they did not. Unfortunately I think you have hit the nail on the head… show me the proof. You won’t get it because the government is the most sick and twisted group to live nowadays. Greed and power, that’s all it is. There is no thought for the public and absolutely less for the welfare of the animals. Don’t they understand that every living thing, no matter how small, is such an integral part of this universe? When they are gone they are gone. These vile people are just the same as everyone else… YOU PUT YOUR DAMN PANTS ON ONE LEG AT A TIME, SAME AS THE REST OF US! Do you think when it comes down to it, you will get special treatment and somehow be saved because you work for the government? They won’t give you a second look. People need to wake up and pay attention. Help inform the younger generation that it doesn’t have to be this way and you can stand up. You can be the voice for the animals. WAKE UP PEOPLE BECAUSE IT’s COMING… Help stop the government from doing this to these animals – they deserve to be here more than we do. PAY ATTENTION! The BLM does not have the rights over any creatures. The roundup is insane and for what outcome? Free will is a number one law in this universe. You mess with free will, you are messing with LIFE as a WHOLE. “Do unto others as you would have others do unto you”. The public along with the universe are crying out to SET THESE ANIMALS FREE!!!! This is not an adoption program…this is slaughter. I am putting out, and asking for, compassion and love in the hearts of humanity to turn this around, wake up, and release these beautiful creatures straight away! I have an idea, take all of these people out there. Leave them in these conditions, no water, shelter, little food. DO NOT CHECK on them for about a month, see how they like it. These animals need to be free, not slaughtered, not in holding pens, FREE. They were on this land before cattle, sheep, etc.. I f I had a place, I would take them and let them roam. If the BLM doesn’t take care of the horses and burros needs, then I say “LET THEM OUT OF THE PENS” to seek the shelter they deserve. I know myself in working around my back yard, standing under one of my fruit trees takes that direct heat off me for a few minutes. I can imagine how the aniamls must feel with a fur coat on. This is insane to have them all in pens for years on end. This treatment of our Wild Herds MUST STOP! Open up the lands you stole from them, back off you BASTARDS! Why???????? are these animals being rounded up & PUT INTO PENS???? I write the BLM almost every day with my concerns about these horses & burros. I also write President Obama,, but this seems to fall on deaf ears. Let these horses out & be free. Thank-you for staying on top of this. Yes, the politics and special interests are working against these beautiful creatures. We see the same dynamic in so many other important issues.